As you probably know, I am an artist and I sell my art work on various "Print on Demand" platform, some based in India, some not at all. The one I am the most active on, and has the coolest range of product is Society6 and is based in the US. That said, they ship worldwide and I have always been thinking of trying it out. US dollar to Indian rupee conversion set aside, what I have been wondering for a long time is how fast the shipping would take and in what condition the goods would arrive. So, I decided to wait until Society6 ran one of their many promo to test it. Ideally I would have waited for one involving free worldwide shipping, but these have been non-existent in the past few months. So, I settled with one offering a 25% off discount instead, beside I was wondering what the shipping cost on a small item would be as well. 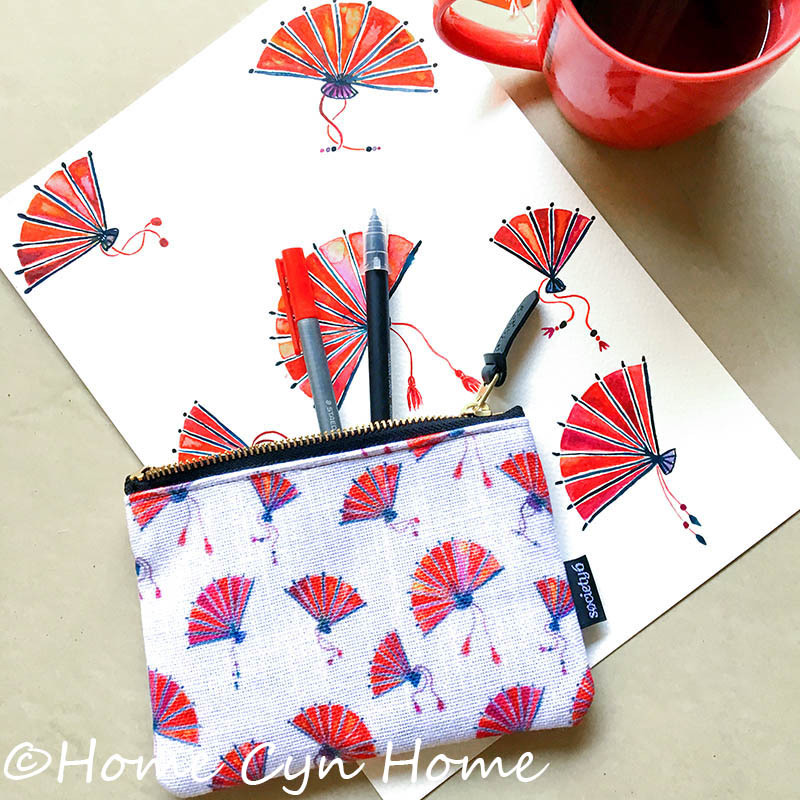 With that in mind, I ended up deciding I would order my "Red oriental fan" design on a Carry-All pouch. I chose the small size because it sounded like a pretty versatile option, though in the future I can totally see myself ordering the Large one which would be big enough to shove my iPad in. When I placed the order I knew I wanted to test the whole shipping thing with something small, and was curious about how colors would translate to fabric as well, which is why I went for a pouch rather than a sticker, or a mobile case (I already have a few with my designs which I ordered from Indian sites). I'm not much of a fan of printed t-shirts, and some of the bigger items may be subjected to custom taxes I didn't want to just experience on my first order. Besides, I can always use a carry pouch in my life. The full retail price for the Small size pouch is 15.99 $ out of which my commission if you buy it for yourself is 1.50 $. When I ordered it, there was a 25% off discount on it but the shipping cost to India was 5 $. In the end, with the discount, plus the deduction of my designer royalty since I was ordering my own design the total price was 15.79 $ INCLUDING the shipping. 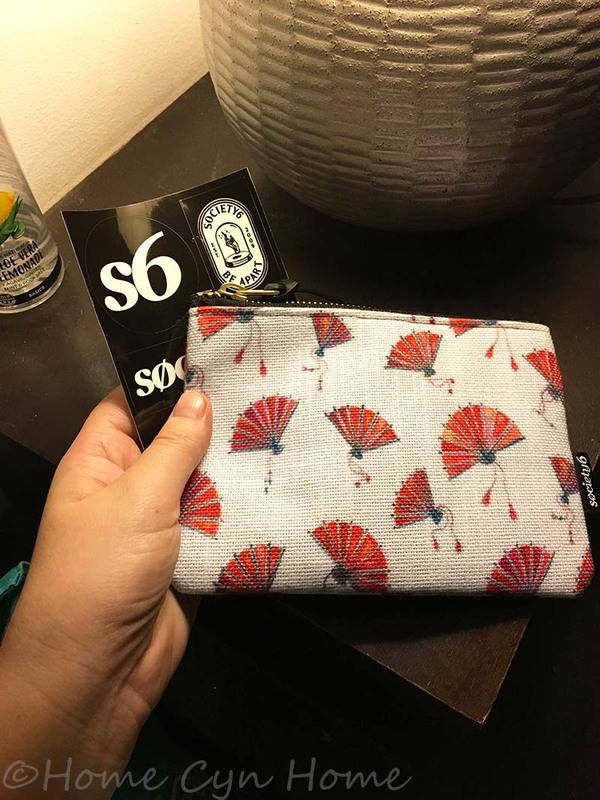 The picture above is the one I took the night I got the pouch, it came in a plastic shipping envelope with the invoice and some Society6 stickers and a promo code to avail 5$ off on my next purchase IF the order is placed within 30 days. I probably won't avail this one, but I will definitely wait until there is a free worldwide shipping promo to order more stuff. Now let's talk about quality shall we? The pouch had a big label inside which you can safely remove because it is really huge and serve no purpose apart from telling you it is made with new material and that the outside and inside of the pouch is 100% polyester fiber. The weave of the outside material is a coarse one giving you a nice canvas feel that looks sturdy enough. The inside is lined with black fabric and has a small pocket inside. The zip works really smoothly. The print is good quality and the colors match my original artwork and it retained some of the subtle shading in the fans despite the fact that the original scanned file is made in a huge format (to go on bigger items Society6 sells). When you shrink a design too much and print it, you tend to loose details which is normal, but I was happy to see that it still retained a whole lot of the original despite that AND the fact it is printed on coarse fabric. Size wise, the small pouch is still big enough to hold a few pens, even though it's probably not it's primary function. The medium size pouch they sell looks more like a pencil pouch than this one. It is the ideal size to store a few make up essential to slip in your purse, and my iPhone could fit in it to which could make it a handy pouch to slip my key, phone and some cash if I am just going round the neighbourhood and don't want to carry my whole purse. What I'll probably use it the most for though is to keep my lip balm, band aids, and spare hair ties and my tiny hand lotion bottle from going all over the place in my purse. That way when I change purse, I will have all those essentials in one place ready to be transferred to the next purse. All in all, delivery to India is fast. That said, yes the prices once converted in rupees can be a bit steep on many items, so really do try to place your orders whenever they run a promo, preferably one with free shipping to save money. My pouch price once converted in rupees that day was 1085 rupees, a tad pricy, but if you really have a crush on any of the design S6 offers, then I'd say it's worth it because not only you won't find that design in any shops around you unless it's been pirated (and it's not cool) plus remember that your purchase pays an artist, even if on a small size pouch my royalty is 1.50 $ this is still fair considering Society6 is handling the manufacturing and shipping, not to mention hosting of my designs on their website. 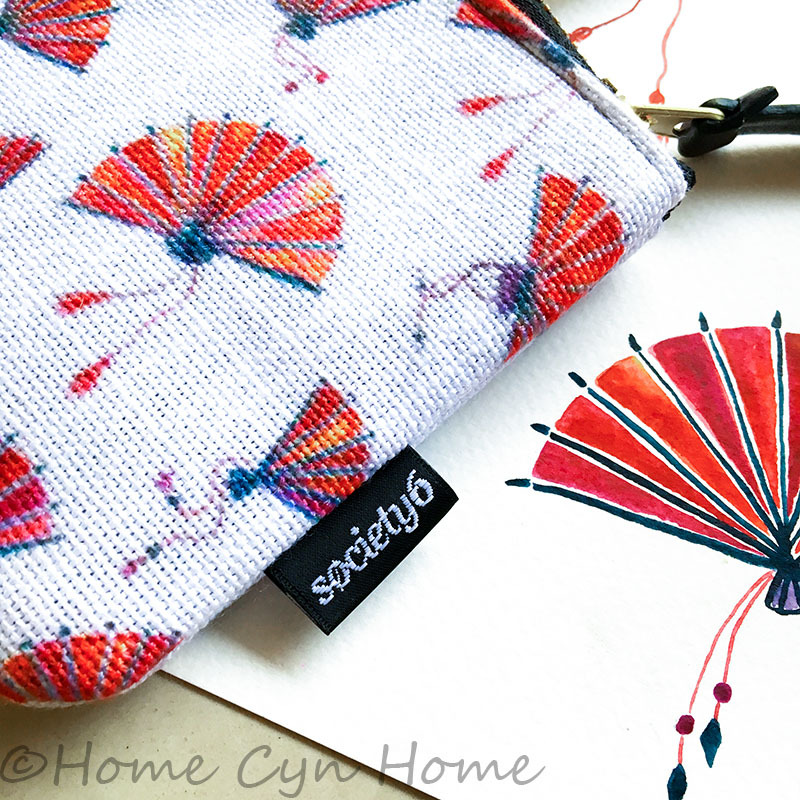 One last thing you must remember if you order from India, is that there is no cash on delivery option, and you must pay via PayPal as Society6 does not support direct payment with Indian credit card. Something I don't mind at all, because to be an artist selling on Society6 you need a PayPal account to get paid anyway.